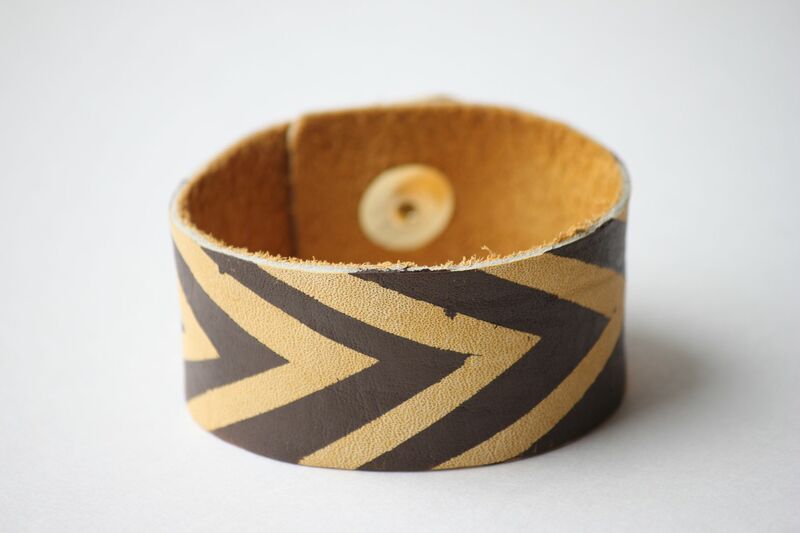 Decide how wide you want your bracelet and cut the leather accordingly. 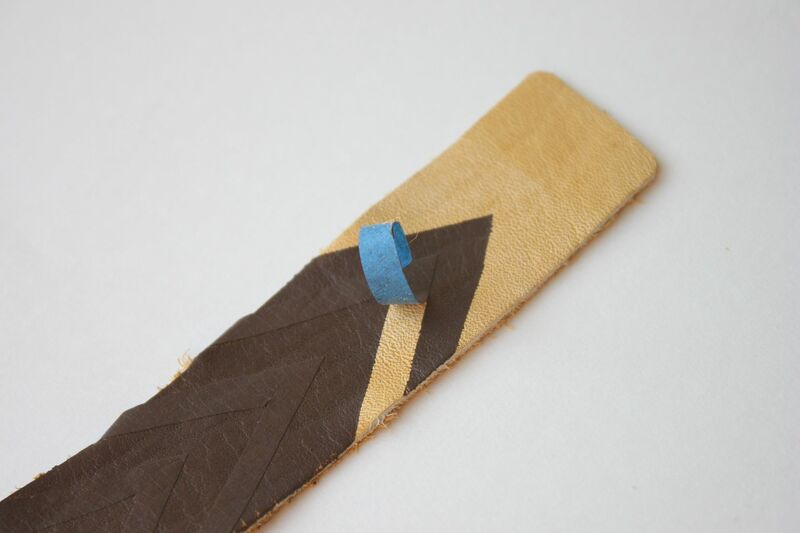 Cut out thin triangle strips like above and place evenly spaced along the leather strip. 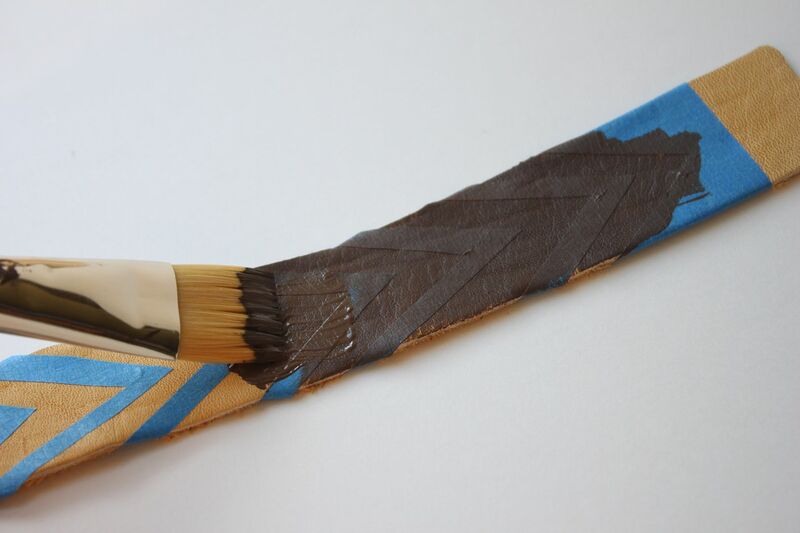 Paint the strip of leather. 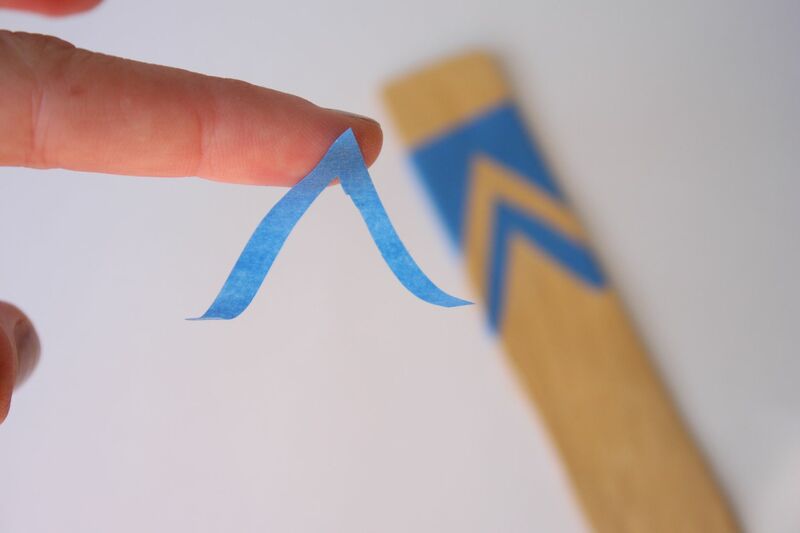 Wait about 20 minutes until the paint is dry (I am so impatient so this was hard) and remove the blue tape to reveal the pattern. Such a fun little accessory to make! 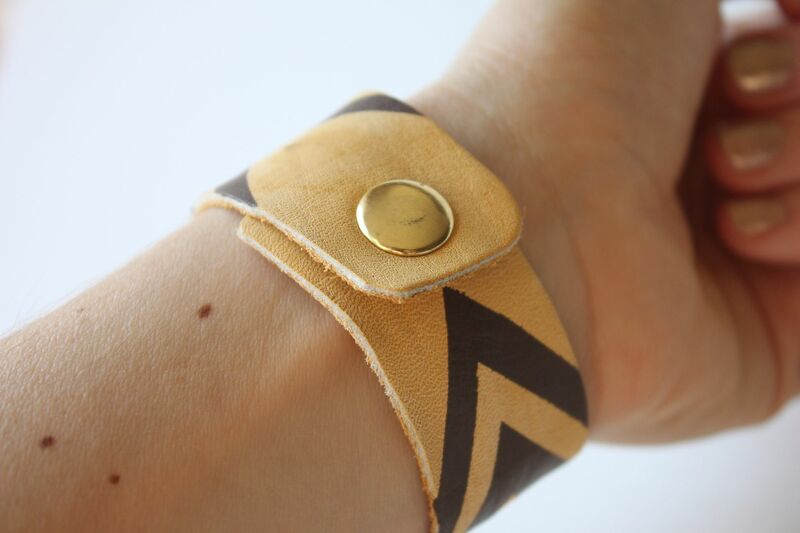 Plus, the whole project only cost me $5 (cost of leather) since I had everything else. Don't forget to enter the giant giveaway from JewelMint here! Hahaha. Cute bracelet, even cuter about eating the 1st piece and the CUTEST about the hubby. ;) Sharing the chocolate: THAT is love. I always admire the ones who craft jewelry themselves, you're great at making bracelets! Very creative and easy too! I like this! I have almost everything to make it - pinning so I remember to actually do it! Wow!! This is adorable! First DIY I've ever seen that I thought I could actually accomplish! So cute! I totally love this!!! This is amazing, you are soo creative! Definitely making 10 or 20 of these for gifts for the holidays! So pretty! I LOVE all of your jewelry! This is such a cute idea! I wish I were as crafty as you! Thanks for sharing another great DIY jewelry piece! Hope you have a wonderful day! This is awesome. I really want to try making these! It would be a perfect xmas gift too! you should make more of these and sell if its not gonna cos you too much...someone needs to change the trend with an invention and i think you just did...cool idea!!! hahaha Darn that sharing!! :) LOVE this DIY!! The bracelet turned out really cute. Brilliant and beautiful! Way to go! The last little sentence made me laugh. I love Advent Calendars! And your bracelet turned out great! ah! i love this! so cute and so simple!! What a fun and cute idea. Gosh you just have the best ideas out there and I absolutely love reading your blog. I keep coming back to get to read your tips on skin care or whatever else you have in mind. Hahaha, that is a bummer! Cool bracelet. Mmmmm this is so well done, girl! Great job. 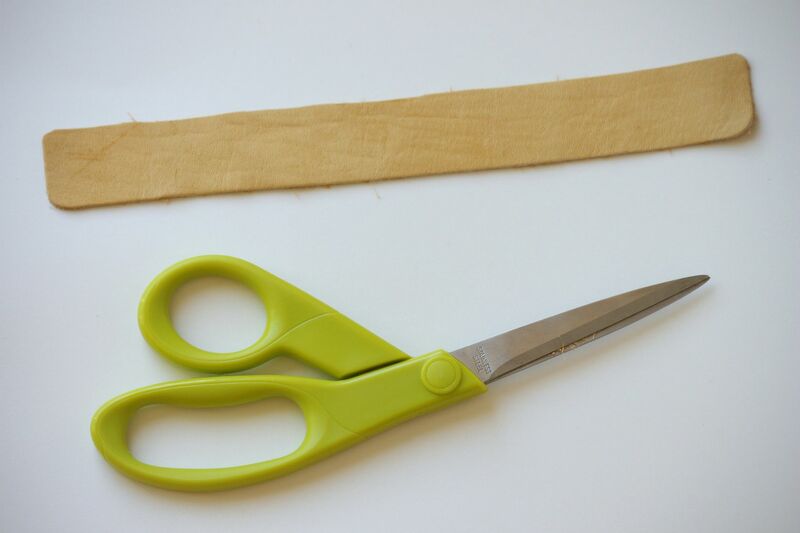 You always have the most delightful, easy to make accessories. I love your DIYs so much. You should get the tomorrow's advent chocolate for rocking this project! Love it! What a fun project! Super cute. You are so stinkin' crafty! I pinned your clay bracelets you posted about last month, on Pinterest. Someday, I will make them! This is too cute! :) Love it! 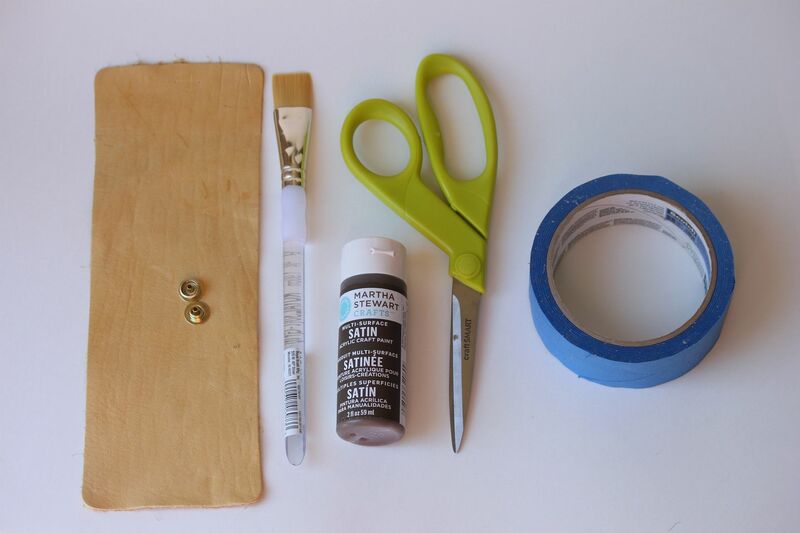 I always LOVE your DIY jewelry tutorials, Lindsay! :) So creative! Would love for you to link up at Find Your Craft Friday over at my blog if you have time... Have a great Friday! You have the greatest ideas that always come out great!! I love this!! Seriously, you come up with -the best- ideas!!! I love your project!! I just featured it on my blog! I'm a new follower! I don't know why I hadn't thought to paint leather. Simple and beautiful!